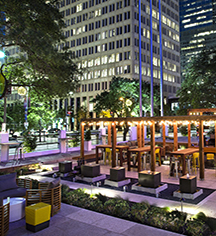 An intelligently curated cocktail list and relaxed courtyard setting make Part & Parcel the perfect downtown destination to meet with friends or make new ones under the Texas stars. Celebrate with delicately infused spirits, classic cocktails, and original libations prepared by the expert mixologist team, or indulge in the hotel’s private label bourbon, Edgar’s Truth. Share the tempting small plate menu of Texas-inspired favorites like chicharrón, deviled eggs topped with fried oysters and candied bacon, and a craveable assortment of street tacos. So grab a chair, raise a glass, or just say hi at Part & Parcel. Edgar’s Hermano harmoniously blends Houston’s native Tex-Mex cuisine with Sotherly’s trademark classic Southern fare, under the direction of Executive Chef Sylvia Couvarrubias. The result is some of Houston’s most inspired and authentic downtown dining. Excite the palate with enticing menu items like Texas corn cakes with pork chicharrón and cotija cheese, mac and queso with chipotle grilled Gulf shrimp, and the award-winning Southern fried stuffed chicken with masa grits and candied bacon jam. Open daily for breakfast, lunch, and dinner, so head on over anytime - your taste buds will thank you. Edgar’s Hermano stylish bar features an inventive cocktail menu that puts a Texas twist on everyday standards. Try local favorites like Sotherly’s own Edgar’s Truth bourbon, named in honor of Edgar Sims, founder of the predecessor to Sotherly Hotels and a bourbon fan himself. Enjoy an authentic Houston coffee experience at Buffalo Bayou Coffee. Choose a favorite eye-opener from a tempting variety of coffees and teas, as well as lighter bites for breakfast and lunch, including freshly baked pastries, handmade sandwiches, salads, flatbreads, and soups. 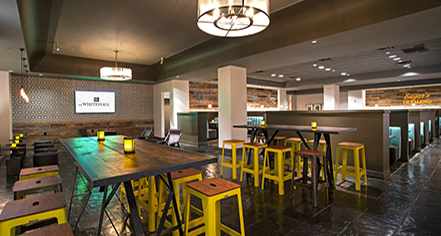 Sotherly Hotels created the Buffalo Bayou name and concept specifically for The Whitehall, with the name as a nod to its Houston roots. Buffalo Bayou Coffee exclusively brews local JAVA PURA coffee. Started in 2008 by two native Houstonians, JAVA PURA is a Houston-based coffee roaster dedicated to bringing the best coffees from premier growing regions around the world to the Bayou City. JAVA PURA roasts all of its beans locally in its own small-batch drum roaster and then makes them available within 24 hours, thereby ensuring the best possible product.